Good article there. From the man who taught me CP/M - it's true! I'd guess 30% of the queries on user sites like this relate to wireless issues. Sky and other ISP's have a completely irresponsible attitude to wireless -- there are 20 networks in my neighbourhood and I know many are in tiny bedsits. Wanadoo installed a friend's system with the wireless router inches away from the wireless adapter. The first decent engineer he had in swapped him to ethernet -- instant speed boost. I've been trying out a pair of Devolo dLAN 200 AVdesk units. Easy to setup, much faster than wireless. Powerline networking - the next big thing! They're just plug in and go! You need to start with two units. One unit is connected to the router via ethernet cable. The other unit is connected to whatever device you need to have on your network (computer, games console, TiVo, whatever) also via ethernet cable. That's it! The AVdesk units are advertised as 200Mbps, I think I have read somewhere that actual throughput is about 70%. There are AVplug type units that are advertised as 85Mbps but I haven't tried them. 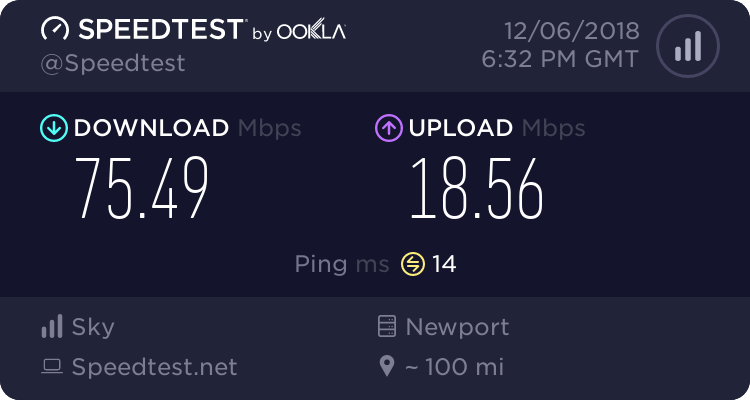 Compare that with 802.11g wireless, which is advertised as 54Mbps or 108Mbps but actual throughput is maybe half that speed, and you can see the difference. I think the AVdesk units can comfortably stream video across your network. They're a bit pricey but in my opinion they are worth every penny. I've yet to see a bad review of Devolo kit. I've been using Devolo for about six months now. Setup once (5 mins max) and forget they're there. Wonderful!